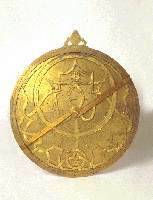 The astrolabe, together with the cross-staff, were the tools available to Drake for determining latitude. This astrolabe was made for Queen Elizabeth by Thomas Gemini in 1559, and so was in English service in Drake's time. Comparison of all latitudes given in the voyage accounts with actual latitudes shows about 16 minutes error either side of true latitude. Latitude 38 limits the area of search for the landing site to a small distance north or south [of Drakes Bay] but does not pinpoint the site. The claim that latitudes taken on land were categorically more accurate than those obtained at sea, and that therefore the harbor latitude is particularly accurate. The claim that secrecy and censorship were methodically relaxed over time, resulting in an ever more accurate latitude emerging in successive published narratives. The Guild "comparison" includes latitudes from the first part of the voyage, most of which come not from the reports originating on the Golden Hind but from the indeed very accurate records from one of the other ships in Drake's flotilla, the Elizabeth. Once the Elizabeth abandoned the journey, the error of subsequent latitudes rises sharply. This is not the only problem; the guild average simply ignores several latitudes that are far off the mark, and includes others that depend on highly speculative identifications of locations. In at least one case the Guild uses a latitude (for Cape Mendocino) that was not included in the narratives at all. It is unlikely that any more major sources of information will be found, though it is possible that bits of information will be, which by careful analysis and interpretation, will further confirm the conclusions of this study. By careful examination and analysis of information stated or implied in the voyage accounts, careful correlations have been made, and a web of evidence has been accumulated which supports the facts as given, resulting in a positive identification of the site of Portus Novae Albionis within the Point Reyes National Seashore. Appendix XI of this "web of evidence" is titled "Comparison of Latitudes Recorded in Accounts of Drake's Voyage of Circumnavigation." Because the claims of accuracy resulting from this comparison are much greater than seems indicated otherwise, a closer look at some of the contents of this appendage is in order. World Encompassed mentions only the Cape ("Cape Saint Mary") at the mouth of the river, but Cliffe specifically describes the island and locates it "being in 35 degrees of Southerly latitude." Drake landed a few leagues within the estuary and remained two days, during which time he probably verified his latitude from an observation ashore. wee passed by cape Saint Mary, which lies in 35.deg. neere the mouth of the river of Plate. The above is of one of the Guild's thirty-six such analyses, among which there is no such omission of Hakluyt's mysteriously belated and quite accurate latitude, given in "The Course," of the Island of Cano, nor of the highly touted 38 degrees assigned to Drake's lost harbor. The "Famous Voyage" Rio Plate latitude is, all by itself, devastating to the credibility of the Nova Albion anchorage figure; its absence from what purports to be a "comparison of latitudes," together with the other similar if less consequential omissions of latitudes unflattering to the World Encompassed, can only be viewed with grave suspicion. The next grossly inaccurate latitude given by the narratives, in this case from the World Encompassed, is of Mocha Island. There is no question whatsoever about the huge 1 deg. 22 min. error. Mocha Island is not found on the Guild list, nor is one word said about it anywhere else in Aker's analysis. Suspicion grows. Next, two of the three most inaccurate given latitudes of positively known locations on the Pacific coast, Arica and Valparaiso, are listed by Aker but excluded from the Guild computations, because, of course, their stated numerical values must have been some sort of literary or typographical errors, rather than navigational mistakes. After all, how could a navigator as skilled as Drake, with an average accuracy effectively equal to the maximum theoretical precision of his instruments, make such mistakes? (The possibility that the Nova Albion Anchorage latitude might also be a typographical error (shudder) is never even whispered.) The arbitrary exclusion of these two latitudes dramatically lowers the average error, just as do the presumptive assignments to unverifiable locations of other stated latitudes. Why the Mocha Island error is not likewise listed and then excluded from the computations is unclear; perhaps the thought arose that throwing out three awkward latitudes might arouse unwanted curiosity in even the most sluggish reader. It [Cape Mendocino] was probably only seen in passing at sea as no landings were said to have been made by Drake. This crafty statement is apparently intended to explain the substantial error of the stated position, and, in reinforcement of a recurring Guild theme, to increase the difference between latitudes presumed to have been taken on land and sea. The inclusion of this latitude also attempts to associate Drake and the narratives with a latitude for a known location in Nova Albion; such an association does not exist. Perhaps the greatest divergence from reason in the Guild analysis lies in the use of latitudes given in the narratives to identify otherwise unidentifiable locations which are then presented as evidence for the accuracy of the latitudes themselves. The most outrageous example of this circular illogic involves Drake's Nova Albion anchorage. Unbelievably, the Guild includes Drakes Bay and the 38 degrees of the "Famous Voyage" and the 38 degrees 30 minutes of the World Encompassed in its computations: Drake's Estero, the Guild's would-be landing site within Drakes Bay, lies at 38 deg. 2 min., and the average error of the two accounts here is thus given as sixteen minutes. Aker pulling himself up by his own bootstraps is not a pretty picture. It goes on. The largest admitted error among the nine Western Pacific locations cited by the Guild is for the given latitude of the island of Teranate. The World Encompassed says, "This Terenate stands in 27.min.North latitude." Teranate is at 0 deg. 48 min. N, so the error is 21 minutes. The above-Guild-average error being indisputable, the Guild nevertheless attempts to turn it to advantage by adding the comment that "The account states that Drake did not go ashore here." The point of this seemingly cryptic remark again has to do with the insistence of the Guild that the latitudes taken on shore were more accurate than those observed at sea. The remark is highly misleading: The World Encompassed, well into the ten pages devoted to Teranate, indicates that at one point Drake was dissuaded from going "ashoare at that time," that time being during a spat with the King, Babu. Instead of going himself, Drake "sent certaine of his gentlemen to the court." But nowhere does the World Encompassed say Drake never went on shore, and two Spanish accounts of the Golden Hind's stay at Teranate state that "Captain Francis went to the fortress of Teranate ...." and "He [Drake] went ashore at different times ...." It would seem that there was ample opportunity for Drake to have taken a sighting from land. In summary, the average error in latitude for places that can be reasonably pinpointed (36), excluding the doubtful latitudes of Valparaiso and Arica, is about 16'. Of these, the average error for latitudes that were probably obtained on shore is about 09' with nearly half of them being of less than 10' error. The average error of latitudes probably taken at sea is about 21'. Polite terms fail; the appropriate word is the American slang term used to label the odoriferous end product of the male bovine digestive process (which at least has some value, as fertilizer). A realistic average error, derived through a comprehensive new analysis by the present investigator, is at a minimum around half a degree, or roughly double the Guild claim. (An even gloomier picture can be painted without difficulty by being very strict.) The stretch of coast that falls into the bounds of this more realistic figure thus covers 1.5 degrees, close to 100 miles, from 39 degrees (the 38 deg. 30 min. of the World Encompassed plus the average error) to 37.5 degrees (the 38 deg. from Hakluyt less the error). But another question is whether the average error, whatever it might be, should be used at all in defining search boundaries; it can be argued that a much more meaningful figure is the range, not the average, of errors. Using the range of errors, even after tossing out a few of the wildly inaccurate reported South American latitudes, results in a search area again about doubled - and places the Guild claim into the context it deserves. Why was this nonsense not challenged sooner? As mentioned elsewhere, most opposition to Drakes Bay has come from proponents of sites well within sixteen minutes of latitude of that place, such as San Francisco Bay and Bolinas Lagoon; no one wanted to rock the boat in which everyone was happily paddling along. Supposedly objective analysts also failed to hoist storm flags: Warren Hanna, in his 1979 work Lost Harbor, instead of exercising his frequent skepticism blithely parrots the sixteen minute figure, citing Aker as the authority without taking a look for himself and thus losing a recent opportunity to debunk this particular myth; Henry Wagner missed an opportunity, in 1926, to slam the door on future gibberish when he pointed out in a footnote that some of the South American latitudes are well off the mark, but failed to follow through with a systematic analysis. So, until now, the "Famous Voyage" harbor latitude has survived to remain the centerpiece in the dwindling array of evidence on which claims for Drake's presence in Marin County are based. ... as Wagner pointed out, the Spanish ambassador, Bernardino de Mendoza, undoubtedly objected to the claim on the basis that the Cabrillo discoveries reached 43o or even to 44o and higher. So little can be made out from the English accounts about what happened after Drake returned, and so much of Mendoza's correspondence is missing that we are left to surmise that when he found out that Drake had been on the Northwest coast and had taken possession there, he complained that the Spaniards had already done so long before. The Queen's answer to him, recorded in Camden, is significant of something of that sort. Wagner's "we are left to surmise ... that ... he complained" is a very long way from the words Aker puts in Wagner's mouth - "as Wagner pointed out ... Mendoza undoubtedly objected." Furthermore, Wagner says not one word about any latitudes here - all of that is pure Guild fabrication, designed to bring a now deceased authority in on the side of a Guild argument (an authority who, by the way, shredded the case for Drakes Bay made at the turn of the century by the Guild's intellectual predecessor, the dogmatic George Davidson). The invocation of Cabrillo by Mendoza via Wagner is yet another of Aker's inventions; Wagner certainly did not put Cabrillo's name into Mendoza's mouth - Wagner was considerably less wanton than Aker with his attributions. This does not answer the question of the actual effects of censorship on the published harbor latitudes; the subject itself is too involved to discuss here, and the above is intended merely to provide another example of Guild tactics. Documentation of further such maneuvers, and a look at the real issues, are provided in Francis Drake in Nova Albion - The Mystery Restored. In the past, the Drake Navigators Guild has been able to maintain firm footing in Drakes Bay by manipulating the complexities and confusions that surround all aspects of Drake's great voyage, including the reported latitudes, to shroud the weaknesses of its contentions and to divert its potential critics, most of whom, unfortunately, have been most concerned with preserving their own pet theories. However, a close objective analysis reveals just how tenuous the Guild toehold on the crumbling cliffs of Drakes Bay really is, and will, perhaps, put a long-overdue end to the obfuscation.